The White Dog Blog: Happy Birthday Ellie! We hope Ellie has a great birthday. You look ready to celebrate..maybe some zoomies..
You look ready to par-tay! Happy birfday to Ellie and that is an adorable photo! Happy Birthday to Ellie! 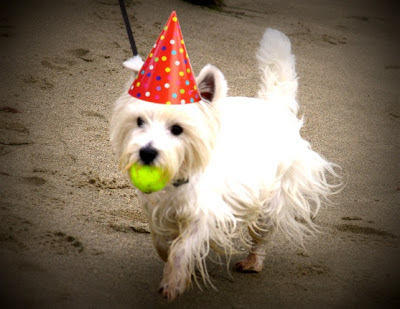 You look like you're in the true pawty spirit, Duncan!